This is the second of a two-part post on caustic “air” measurements. In my last post I showed how it is possible to have two similar “air” readings in packages, even though the Total Package Oxygen (TPO) was wildly different. It this post we will examine the theoretical basis for the differences and dive a bit more deeply into why the correlation between “air” and TPO is hit-and-miss. A couple of years ago I worked with a soft drink manufacturer. They wanted to see if they could correlate the dissolved oxygen content of their packages with “air” testing. They collected hundreds of individual data points, taking two different packages off a canning line at a time and running an “air” test on one while measuring dissolved oxygen concentration on the other. Their results were confusing, so I thought that maybe by plotting the pairs of data – with the “air” results on one axis and the dO2 value on the other — things might make some sense. What shaped up instead was a fan-shaped blob. At first I wanted to blame measurement technique or instrumentation malfunction. But the more I tried to make sense of the data, the more I decided there had to be something real I just didn’t understand. It then dawned on me that what the data represented was a combination of “air” trapped in the headspace and “air” coming from the liquid. My next move was to plot how the data would look if 100% of the “air” were originating in the headspace, versus 100% of the “air” originating in the liquid. The calculations for the headspace were simple. We know that “headspace air” is about 20% O2 and 80% N2. The liquid calculations required a bit more consideration, because if 100% of “air” originates in liquid, then solubility laws will result in air that has about 37% O2 and 63% N2. The area of the graph between the two lines shows all of the theoretical possibilities for valid TPO concentrations based on a given air concentration. 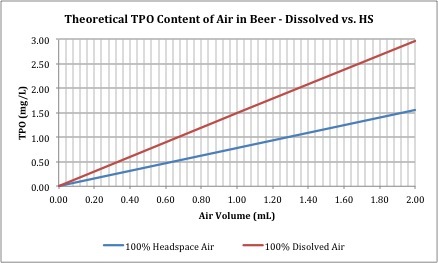 For instance, if the “air” volume is 1.0 mL, the TPO will range between 0.78 ppm and 1.57 ppm. I wish the reality of these theoretical values could be easily applied to actual package situations, but in my experience the “air” tester rarely picks up all the gases, so it almost always underestimates TPO. The difference seems to depend whether the majority of the “air” is trapped in headspace or is dissolved in the liquid. My final thought is that “air” measurements can be helpful in certain situations and are always better than not measuring at all, but to seriously zero-in on problems, dissolved O2 measurements (calculated to TPO) are the way to go.